I am back from my second trip to Asia and thankful for the many opportunities to be of assistance to elephants and their mahouts. During these five months I accomplished all that I set out to do and more! The first many weeks of my trip were dedicated to mahouts and elephants in Thailand: pedicures, elephant training and teaching elephant trainers a gentler, more humane way of management. Each day was filled with morning and evening training sessions and midday pedicures. 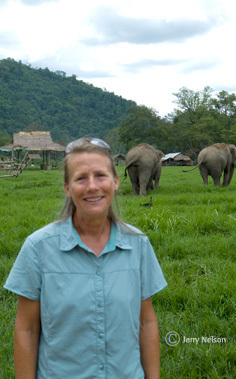 The challenges were great on many levels, resulting from the variables in mahout skills, owners’ willingness to recognize welfare issues, access to proper facilities for foot care and protected contact training, as well as each individual elephant’s personal reaction to her/his expected involvement. Unfortunately, elephants in Asia are managed one way: brutally. Negative reinforcement management is all the mahouts know, all the owners know and the only thing the elephants have experienced. As a result, the elephants and many mahouts are beaten down, unenthusiastic and, in most cases, non-responsive. Even though they claim to have a training tradition, elephant training in many parts of Asia appears to be done in an unstructured and haphazard way. Mahouts yell, wield a heavy stick or nail and hit or stab the elephant simultaneously with giving a verbal command. The elephant is not provided the opportunity to respond before pain is inflicted. This unskilled approach to training actually teaches the elephant to respond only after experiencing pain. This is not training -- it is abuse. In addition to instructing mahouts on what they should do, I attempted to convey what they should not. My effort to explain learning theory was made difficult by the language barrier. It is not enough to show the mahout how to train; one must be able to explain why things are done a certain way. Gestures and broken English fail to convey enough in-depth information for the mahouts to truly comprehend the training, especially when the training is counter to their way of thinking. In the case when a translator was present, some progress was made. In each case, the elephant was fearful. Experience tells her/him that when a mahout approaches pain will follow. The fight or flight response caused by fear switches off cognitive function of the brain. The mahout yells louder in an attempt to intimidate the elephant, which only succeeds in frightening her even more. When the mahout begins to practice a gentler form of training and the elephant realizes that s/he is not going to be hit, goaded or stabbed, they relax. Over time they begin to respond voluntarily. Positive reinforcement training is the only option for the future of Asia’s captive elephants. Mahouts have a deeply engrained tradition of elephant training. To influence their beliefs takes patience and perseverance. I found that mahouts showed interest in my desire to further their education only after observing my level of expertise. These mahouts, no matter how lacking their skills, see themselves as professionals. Mahout skills varied from city to city, region to region and country to country. In some areas the mahouts were receptive, others were bored, while others only wanted to ensure that they did not have to work overtime. The more impoverished the mahout, the more difficult it was to engage him. The common thread that appears to weave through the entire mahout nation is alcohol abuse. But all is not hopeless, I was fortunate to work with many mahouts who demonstrated a sincere desire to better their skills and provide a quality life for their elephants. I am confident that as my work continues I will meet more and more of these men. Their continued success is key to the welfare of captive elephants. With well trained, fairly compensated, caring mahouts as examples for others, abuse can be replace with a more humane form of elephant management. Education is the key. The second half of my trip took me once again to India and Nepal. In India, I decided on a location for an elephant sanctuary. Following the Indian government’s decision in 2009 to ban elephants from zoos, the development of sanctuaries to care for them is essential. The land has been located and legal proceedings are underway. This model sanctuary should be up and running by late 2012. The intent is to provide a home for displaced zoo elephants and create a model that can be used country-wide to accommodate all the 175 elephants who need to be moved. Efforts will be made to rehabilitate the rescued elephants and release them in what is called a soft release, where they have access to the national forest on a limited basis. Being cognizant of how limited the precious resources are in India’s national forests is foremost in our strategy to provide a semblance of freedom for our rescued elephants. It is a fine balance we will keep between not disrupting the lives of wild elephants in the area while providing our residents with as much freedom as possible. The last six weeks of my stay in Asia was spent in Nepal. I worked with a knowledgeable team of vets, veterinary technicians and administrators. 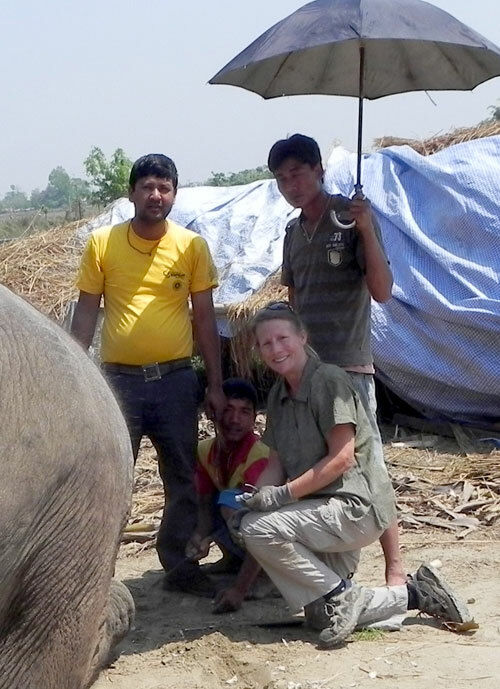 Having a translator made all the difference, enabling me to trim the feet of 62 elephants while training veterinary technicians and mahouts in the skills necessary to provide proper foot care for their elephants. In Asia, mahouts have no tradition of foot care and show no resistance to its introduction. My experience is that they show a sincere interest and curiosity in foot trimming and, for the most part, excel. The degree to which my students excelled at the art of foot trimming gives me hope that change is on the horizon. Much of the problem with elephant welfare in Asia can be easily rectified. Traditionally in Asia, elephants were not confined to urban landscapes as they are today. In the past, foot care was a non-issue as elephants wore down their foot pads and nails naturally with daily activity. But today, elephants in captivity do not exercise properly, nor do they spend enough time walking on the natural substrate of the forests. The result is overgrown foot pads and nails leading to life-threatening osteomyelitis. Later this year I will return to Thailand, India and Nepal to continue my work. There is much to be done for elephants in Asia. My goal is to continue to be of assistance wherever possible—one elephant at a time. Our new website for Elephant Aid International has launched. To read about each of our current projects, visit the Elephant Aid International projects page. I am back from three months in Asia where I explored the world of elephants in their home range; both wild and captive. Regardless that I had an amazing time, this was not a vacation. It was a serious factfinding mission. My goal was to learn about the challenges, trials, and politics, behind the way elephants are kept in Asia. The trip was enlightening. Mostly, I learned that elephants are in dire need of help in Asia. And it was with great pleasure that I realized that I am a person who can make a difference. Doors opened for me everywhere I went, resulting in numerous requests for my assistance. I clearly know the projects I want to work on; where I can make the greatest contribution. I am rejuvenated realizing the impact that I, in cooperation with others, can make for elephants in their range countries. In the coming days I will begin to outline the projects that most interest me. I will be seeking funding for the projects from individuals, corporations, and foundations. I hope you will join me in contributing funds, expertise, and enthusiasm, for the welfare of wild and captive elephants worldwide.